The Motiv Venon Shock has it all at an affordable price. 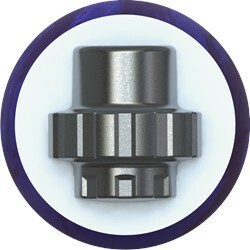 This ball pairs the Gear weight block with the Turmoil MFS Reactive coverstock from the Covert Revolt to produce a smooth but angular backend motion that continues through the pins. The colors on this ball really pop on the lane and produce shocking results on light to medium oil conditions. Similar Balls: Same Hook Potential, Lane Conditions & Coverstock as the Motiv Venom Shock. Great bowling ball. Readonable price for all. MOTIV Venom Shock - Smooth Operator! The Venom Shock is a great compliment to the recent releases from MOTIV. The low RG / Medium Differential Gear core, paired with a new solid coverstock provides a smooth roll throughout, with just enough at the backend to give me consistent carry. The best way to describe it is that the ball seems to drive forward through the pin deck, with less deflection. The pins also seem to stay lower - which I've seen with previous MOTIV balls that utilize the Gear core. After bowling with the Venom Shock for a few weeks, I've determined that my favorite time to use it is on a fresh medium to heavy oil pattern. It really helps to smooth out the lane from front to back. I'm able to groove it right up the track area in those conditions. On short sport patterns, this one also comes in very handy when I'm looking for a "hook/stop" type shape from an outside angle. I feel like this really widens the pocket for me, when more angular equipment would over-react on the back end. This piece is a "must" in my bag when it's tournament time! Description: The Venom Shock is the third installment of the Venom series and again placed in the lower mid-price range. The Venom Shock coverstock has the new Turmoil MFS, which is a modified version of the Turmoil HFS coverstock on the recently released Covert Revolt. For the core, MOTIV again used the Gear Core from the previous two Venom's and the much older GT-1. Reaction: In a one liner the Venom Shock is very clean through the front part of the lane and provides a consistent controlled downlane motion. I have found myself throwing the Venom Shock when playing straighter angles, but when my more predictable pieces do not seem to respond fast enough downlane. The shape it provides is between a mild slower response piece and something mild that is longer and has a faster response. My style doesn't quite allow me to throw this ball on the fresh or heavier patterns at the box surface, but that is not exactly the intention of this piece, however altering the surface to 2000 allowed it match up very well. Believe it or not the Venom Shock is a benchmark ball for me, it allows me to get straighter and still maintain a great shape downlane. Likes: The MOTIV Venom Shock is definitely something special! This ball is an extremely reliable, smooth rolling, beast of a light to medium oil ball! Not only does the Shock look great going down the lane, it is affordable and has the ability to out perform any medium - light oil ball out there on the market. The SHOCK pairs well with the MOTIV Covert Revolt. Once the lanes begin to break down, the SHOCK is your go to ball with very little adjustment if any! When you need something you can rely on when you begin to notice carry down that will push through the oil, you can pull the Shock out of your bag! Your Arsenal isn't complete without the MOTIV Venom Shock in your bag! I am an advanced Right Handed female bowler with a league Average of 200. My ball speed is consistent around 17 mph with a rev rate of approximately 250. Ball is super clean with good movement at the back. Very surprised considered it is a solid. Was able to use the same break point all night, just moving further inside. Will be the first ball out of my bag on house or sport. I have been a Hammer-head for most of my life but a friend convinced me to look into MOTIV. 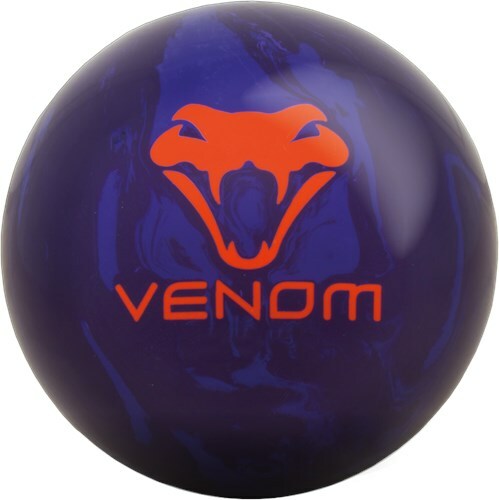 I did a lot of research on the line of balls they offered and decided to try the Venom Shock. WOW!!!! I put a 70x40 @ 4" layout on it and this ball has amazing reaction when it gets to the dry. It hits with the perfect angle and with an amazing amount of power. My first game with the ball I threw my lifetime high of a 254. For a guy who does not bowl overly competitively I could not be happier. I think my new league arsenal is going to be MOTIV based. This ball is the perfect benchmark ball for me. I highly recommend this ball to anyone. This is my favorite ball in my arsenal. In my opinion it is the best ball Motiv has every made. It's a great ball with early smooth hook yet a very strong back end. This ball is very good too use once the fronts has broken down or on light to medium oil. It is very versatile you can play from a lot of different angles from the far left or far right or right down the middle. I am around a 130 to 140 average and I bowled this ball for the first time 2 days ago on optimal medium oil and my first game was a 150. I was pleased with that. My first couple frames were strikes. I realized you wanna be towards the middle of the lane for better control. Then the next game I bested my best score and hit a 197. It never left my with any splits and I was able to hit the pocket about 99% of the time. That 1% I was a little nonchalant on the hook but all in all I can't wait till league night. The ball works very well. I purchased 15 LB ball. Hello! You can use any ball for two handed bowling. This will be a good ball for two handed bowling. It will really get it down the lanes. Hi Fred. You can request for a 13 pound 5 ounce ball in the blue box that says "click to request pin/top weight", and we will let you know what we have in our warehouse after the order has been placed with the specifications. Hello Jason. Yes, you can use the abralon sanding pads on this ball. Yes, this is good for a backup bowler. This is a mid performance ball. Spare balls are made out of plastic/polyester coverstock and that is what you would need for a straight ball. Are these "First run" balls or "factory blems"? These will be first quality balls. Is this the original Venom Shock (has a darker colored cover stock) or is this the new Venom Shock (has a lighter colored cover stock)? This is the original Venom Shock. The Venom Shock Pearl will have the lighter colored coverstock. I am looking for something that is as similar to the old Sapphire Zones. Would this Venom shock or the Pearl be more similar to the Sapphire?? The newer balls today have made more advances compared to the older balls. The newer balls will be more aggressive. You may want to reach out to Brunswick direct if you want to know a comparison on the Sapphire balls, they may be able to find a more comparable ball. Unfortunately, in all of the Venom series, they will be for light to medium lane conditions. Due to the time it takes to produce the Motiv Venom Shock ball it will ship in immediately. We cannot ship this ball outside the United States.